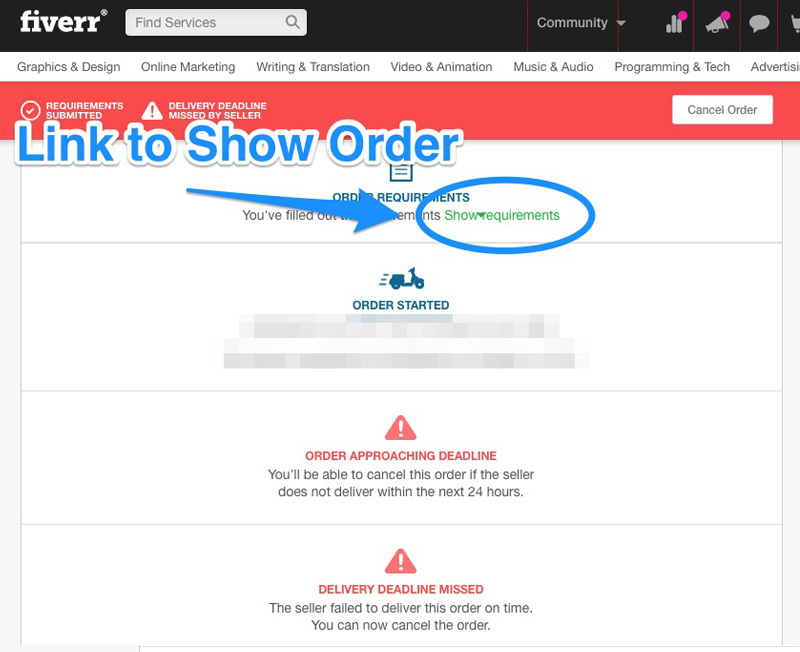 In 2015, Fiverr® made changes to their “Order Activity” page, which is causing difficulty for some sellers to find gig order details from the buyer. This can lead to a misunderstanding that the order requirements were never filled in the first place. Which in return, can lead to order delays. All that’s needed is to check if the information is not hidden behind a link similar to the one that you can see in the self-explanatory screenshot below. The screenshot is from the buyer view, but should look similar with sellers as well. The delivery has missed the deadline simply because the gig owner has failed to notice that the order has been filled in and is waiting for delivery. I just hope that Fiverr would change this back to always visible as it has been previously. Because it has been happening quite a lot. Also, have a look at the YouTube drip feed case study for a demonstration on the power of five bucks. Hope that my little how to helped!